In 1857, a large limestone residence was built on the southeastern corner of Forsyth and Madoc St. It was occupied by the Marmora Ironworks manager, David Bentley and his wife, Sarah Hodgkins. Thomas Peter Pearce, founder of the Marmora Pearce Lumber Company and his wife, Margaret Campion also occupied the Bentley residence in 1870. In 1880, Gordon McWilliams and his wife, Chloe Bonley would change the building from a private residence to a public hotel which was called the Royal Hotel. Click here to read his beautifully written 1906 obituary. While a 1913 fire did some damage to the hotel, a fire on May 24, 1914, did serious damage to the interior of the newly renovated Royal Hotel, and when repaired was reduced to two floors. After the fire in 1914, ownership of the Royal Hotel property was syndicated with locals buying shares in a new company formed to rebuild it. "When it is completed, the Hotel will be in a class by itself as far as smaller towns and villages are concerned." 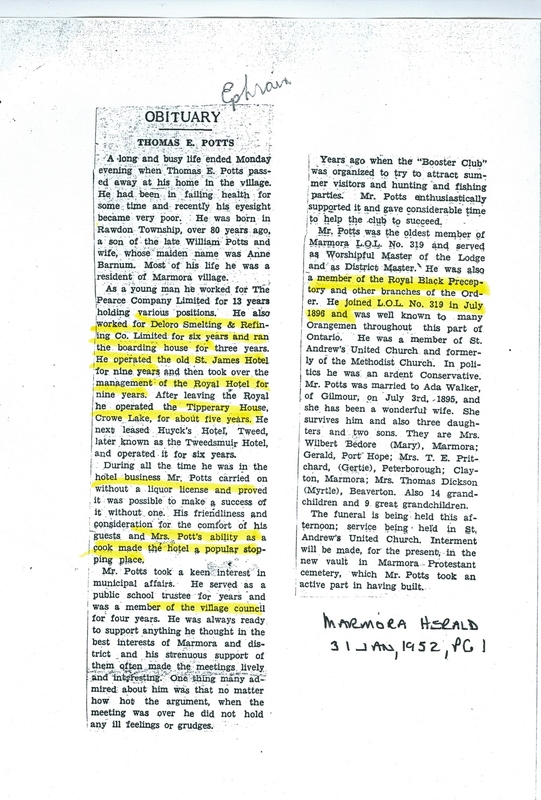 The Marmora Herald reported the forming of a Hotel Company on February 5, 1914. "A meeting was held on Tuesday evening to organize a hotel company with the objectives of erecting a new hotel on the site of the old Royal Hotel . Upwards of $5000.00 worth of stock has been subscribed locally and there seems to be little doubt that the work will be undertaken at once. The need for a new and commodious hotel was felt keenly by practically every businessman, as the number of travelers and others visiting Marmora at present is hardly 25% of the number before the fire." The Royal Hotel was very much the center of local activity. It boasted its three floors and a fine porch. It provided superior accommodations for visiting dignitaries including Prime Minister Arthur Meighen. In reviewing the village of Marmora, a very high attribute must be paid to the hotel accommodation which has been provided. The leading hotel of Marmora is the "Royal" of which Mr. Alfred Till Neal is the proprietor. It would be difficult in any of the towns in this section of Ont. to find a hotel to surpass in excellence this particular house and a few could be found which will equal it. Mr. Neal has had a number of years experience in the hotel business and opened this house in Sept., 1914. During his tenure of the Royal Hotel, he has given to the travelling public the results of his experience , which are greatly appreciated by all who stay with him. The hotel is a 2 story structure 50 x 80 ' in dimensions., beautifully fitted and contains 15 well furnished rooms and an elegant dining room. The comfort of the guest has not been forgotten fun the fitting out of the rotunda and everything is carried on business like and modern lines. Mr. Neal is to be congratulated upon his success in securing a staff capable of carrying out his business in a way fitting to the house The office staff is looked after by a qualified clerk and the dining room staff can always be relied upon to give their every attention in serving the meals which are prepared by a 1st class chef. Too much cannot be said of the cleanliness and perfect condition of the bed and sitting rooms. In the cafe will be found a complete line of fine wines, liquors, ales, beers and cigars. A number of sample rooms for commercial men will be found in connection. At the rear of the hotel is a splendid barn with sheds of large dimension, affording 1st class accommodations for the general public. Affable and pleasant Mr. Neal gives his close personal attention to all the details of the business and allows nothing to be overlooked that would add to his guests comfort. Since 1906, after Gordon McWilliam's death the following proprietors operated the business solely as a hotel. William Golding, Mr. W.E. Simons, Alfred Till Neal, Thomas Potts, who ran the hotel from 1925- 1934, Johnson (1934-46) Stanley Lowe (1936-44), Horace Neath (1944- 1952 when he died) Lloyd Blue, Albert Payne, Mac Cassleman and the E.R.L .Co. of Toronto. As a young man, Thomas Potts worked at Deloro Smelting and Refining Co. Ltd, and ran the boarding house for three years. He operated the old St. James Hotel,, the Royal Hotel in Marmora, the Tipperary House on Crowe Lake, and Huyck's Hotel in Tweed (Tweedsmuir). Mr. Potts was also the oldest member of the Loyal orange lodge at the time of his death in 1952. In 1937, Stanley Lowe had a new and very long electric sign erected over the main entrance to his hotel . The Marmora Herald declared that no stranger entering the village will have any difficulty in locating the hotel. It read 'Royal Hotel'. That same year, he had a new Gurney Foundry furnace installed, weighing over 3.5 tons, ordered and set up in 48 hours. Sonya Towns sent this photo and writes: This is a photo of my grandparents, William & Isabel Ketcheson, with my Great Aunt Marie West, outside the Women's Entrance to the Marmora Hotel in 1944. It wasn't until July 1958 that the hotel received a license for the dining room. In April 1951, Frank Bobyk, a local contractor built a 50 ft. by 18 ft. two storey extension between the hotel and the drug store to the south of it. It was not built until 1951. Don Walton and Hindu Ellis, "The alligator man"
Derek Meredith and Donald Bradfield, who operated Dizzy's dining and dancing, . Next to try their hand, in Aug of 1999, were Paul and Mary Masterson, who ran Masterson's family restaurant. For a while the hotel remained unoccupied until Frank Diodama converted the building into rental units on the second floor and commercial units on the main floor. The building is now under new ownership and although there are still rental units the new owner is trying to make improvements to the once beautiful building.